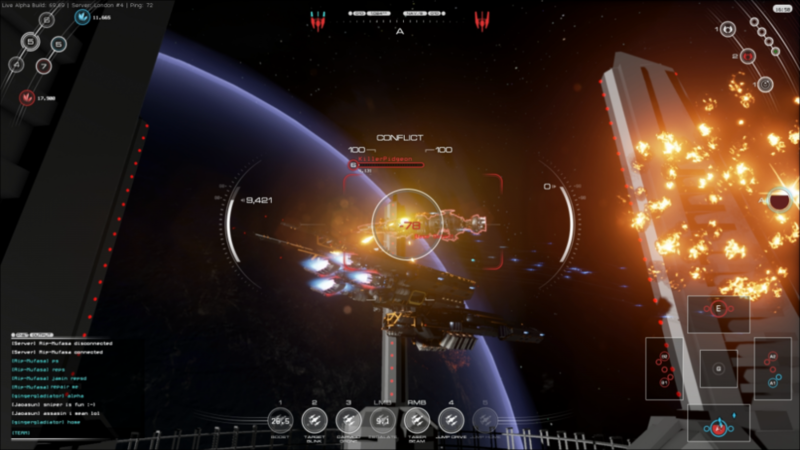 Edgecase's game Fractured Space is an online multiplayer competitive team game in which a small fleet of capital ships duke it out in an asteroid-strewn battle arena, each trying to capture the other's base. This weekend on Steam it's free to try out. I normally try out a game on a free weekend if I had any interest in it at all previously, but the icing on the cake this time was that by playing it this weekend, you get to keep the game!! In gratitude, the least I thought I could do was to blog about the game. I advise anyone with an interest in it to try it out before Monday to get themselves a free copy. It's an "Early-Access" title that's currently in Alpha but don't let that put you off. There's already a complete and stable experience here. I'd heard of the game before but wasn't overly interested myself for two reasons. The first was that while commanding your own Enterprise or Star Destroyer sounds so cool, I've never played anything where you actually feel like you're controlling a massive capital ship, as opposed to any arbitrarily sized space ship (very little scale in space with nothing around you). The second reason was that purely multiplayer games between small teams can be quite intimidating for new players. With a team of 5 players, your contributions (or lack thereof) really matter! Plus if we were talking about a shooter, you're likely to have your head blown off by more experienced players before you've even spotted them.. repeatedly. Neither are the case with this game. The level of detail on the ships is extremely impressive. You can see turrets spinning, radio towers, thrusters firing, missiles launching and little fires start up as you take more serious damage. You can launch fighter drones which really emphasises that you're the bigger ship here. There are space stations and asteroids around also which further give you something visual to sell the scale to yourself, and finally, your crew are real! Not 'real' real, but they are very present. Your (relevant) crew members give you audio feedback when you jump, take damage, capture a target, etc. You select a team of 5 from a few available characters and place them in the roles of Captain, Pilot, Engineer, Comms, and Tactical. I chose as Engineer a girl undoubtedly modelled on Kaylee from Firefly. Quirky southern accent and all. Each character is represented by a piece of concept art and they all have their own advantages and disadvantages. Some engineers might offer faster repair times, while certain pilots might offer tighter turning, but less speed. My only gripe here is that the differences seem (and are) so minimal as to never really offer a practical difference to your combat or play style. I hope Edgecase become a bit bolder in this area and maybe look towards Evolve as an example of how different similar classes can really be. As for the intimidation factor? It was thankfully minimal. In my first moments I figured out how to jump to a new zone, target an enemy ship, and let rip with a cannon and missile barrage. The impacts were satisfying and as he returned fire and bits of my ship started flaking off, I realised there were no 'headshots', but this game was truly about capital ships slugging it out. The fact that you have shields and so much armor plating pretty much guarantees you're never going to be one-shotted. You could be outnumbered and still survive 20 seconds while sending out calls for support from your team mates to come and help or repair you. After killing my first enemy, but taking heavy fire from his friends and as my ship flaked away from under me I performed an emergency jump back to base to repair and upgrade my ship. I was happy that I didn't die there, and I assume the enemy were satisfied that they'd captured another mining station on the map. Everybody wins. It's definitely meant to be played as a team game and right now it can feel a little disorganised but in-game VOIP communications would go a heck of a long way towards helping this. Since the game is currently only in alpha and it seems such an obvious addition, I assume that this feature is on the way. In summary, here's a well-crafted game that's currently free and definitely worth checking out this weekend if you've ever wanted to command your own capital ship as part of a cohesive fleet in a multiplayer team game. My thanks to Edgecase for the free copy. I'll definitely be playing more of this. Star Citizen. Revered or resented?